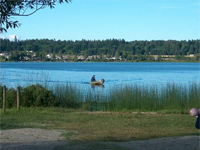 The Living Forest is without question one of the finest RV Parks and Campgrounds on Vancouver Island--or anywhere else! For the second year in a row, RV WEST Magazine readers have voted us Gold Medal status for a privately run RV park and campground! Click on the 'Photo tour of Living Forest and 'Must See' Area Attractions' link above for quick load pictures of the Living Forest and closeby attractions. 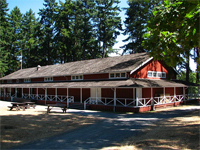 The 50 acre property is in a rural country setting surrounded by magnificent old growth trees adjacent to a heritage farm operated by the Caillet family located on Brannen Lake. 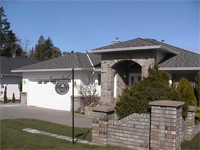 Located close to Nanaimo, British Columbia, the campground is easily accessable by paved road from the Nanaimo Parkway Exit 24. 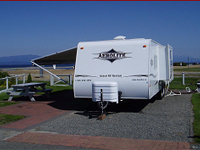 We proudly provide Rv Travel Trailer rentals to Central Vancouver Island in the Nanaimo, Parksville and Duncan area. Our committent to you is a First-Class experience, so you and your family enjoy a fun-filled summer! Beautiful Vancouver Island is the home of myself Chad Rogers, my wife Rhonda and our daughters Emily and Lauryn. As a family we love exploring the many campsites of the Island. We would like to enable you to do the same. 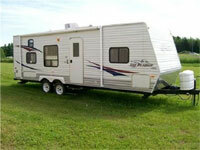 Contact us at Island RV Rentals for more information. 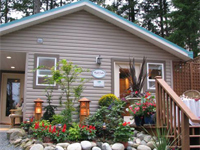 An old fashioned country campground; the kind of place where happy family memories are made. Central on beautiful Vancouver Island, just south of Nanaimo, a lovely 40 acre property nestles near the famous Nanaimo River. Newcastle Island became a Provincial Marine Park in 1961, when the nearby City of Nanaimo granted it to the Province of British Columbia after having acquired the island from the Canadian Pacific Railway in 1955. Situated in Nanaimo Harbour within sight of both Vancouver Island and the towering Coastal Mountains of the Lower Mainland, Newcastle Island possesses a rich natural and cultural history that makes it one of the most intriguing provincial parks in British Columbia. 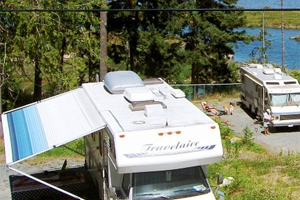 A family oriented campground and resort situated on the shores of beautiful Quennell Lake in Cedar B.C. between Nanaimo and Ladysmith on Vancouver Island. A Shopping mall, Resturants, Pubs & Entertainment are only minutes away. Our season for self contained units with complete hook-ups ( including cable ) is year-around. Tenting spots or non self-containing units our season is April 15 to October 15.